The field of agent and multi-agent systems is concerned with the development and evaluation of sophisticated, AI-based, problem solving and control architectures for both single and multi-agent systems. Multi-agent Systems – Technologies and Applications (KES-AMSTA 2013), held in Hue City, Vietnam, in May 2013. The KES-AMSTA 2013 conference provides an internationally respected forum for scientific research in the technologies and applications of agent and multi-agent systems. In all, 44 papers were selected for oral presentation and publication in this volume. Special attention is paid to the feature topics of intelligent technologies and applications in the area of e-health, social networking, self-organizing systems, economics and trust management. Other topics covered include: agent oriented software engineering; beliefs engineering; desires and intentions representation; agent cooperation, coordination, negotiation, organization and communication; distributed problem-solving; specification of agent communication languages; formalization of ontologies; and conversational agents. 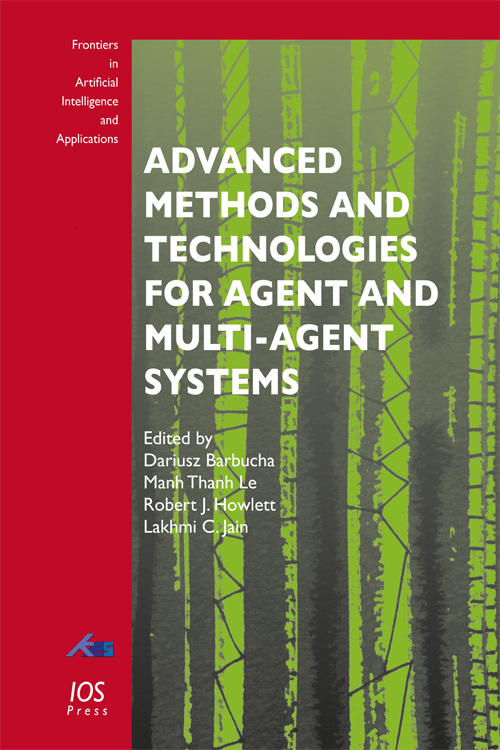 The book highlights new trends and challenges in agent and multi-agent research, and will be of interest to the research community working in the fields of artificial intelligence, collective computational intelligence, robotics, dialogue systems and, in particular, agent and multi-agent systems, technologies and applications. Edited by: Barbucha, D., Le, M.T., Howlett, R.J., Jain, L.C.